Theresa May has said she will form a government with the support of the Democratic Unionists that can provide “certainty” for the future. Speaking after visiting Buckingham Palace, she said only her party could form a “legitimate” administration after winning the most seats and votes. She said she would work with “friends and allies” in the DUP to take forward Brexit, saying “let’s get to work”. The Tories are eight seats short of the 326 needed to command a majority. May said very little about how she would work with the DUP, suggesting it would be the loosest of arrangements. Labour’s Jeremy Corbyn has urged her to quit, saying he is “ready to serve”, while Lib Dem leader Tim Farron said she “should be ashamed” and should resign “if she has an ounce of self respect”. After a disappointing night for the Conservatives, May faces ending up with 12 fewer seats than when she called the election in April, and will need the support of other parties to govern. She had called the election with the stated reason that it would strengthen her hand in negotiations for the UK to leave the EU – the talks are due to start on 19 June. The Tories are forecast to end up with 319 seats, ahead of Labour on 261, the SNP 35 and the Lib Dems on 12. The DUP won 10 seats. Combined, the Tories and the DUP would have 329 MPs in the Commons. Given the seven Sinn Fein MPs are unlikely to take their seats, such an alliance would enjoy a slightly larger working majority but short of that which Mrs May enjoyed before the election. May earlier said the country needed “stability” with the start of Brexit negotiations ten days away. It is thought May will seek some kind of informal arrangement with the DUP that could see it “lend” its support to the Tories on a vote-by-vote basis, known as “confidence and supply”. The DUP has met to discuss what it has said is a “messy” situation. A DUP source confirmed soundings had been made, but nothing formal had been agreed. Talk of an agreement was described as “premature”. The Conservatives have argued in the event of a hung Parliament, May gets the opportunity to form a government first, as her predecessor David Cameron did in 2010 when there was also no clear winner but the party had comfortably more seats than their nearest rival. Labour has said it is also ready to form a minority government of its own, after far exceeding expectations by picking up 29 seats in England, Wales and Scotland. But even if it joined together in a so-called progressive alliance with the SNP, Lib Dems, Green Party and Plaid Cymru, it would only reach 313 seats – short of the 326 figure needed. May has faced calls to quit from within her own party, with Anna Soubry saying she should consider her position after a “disastrous” campaign. However, other MPs have urged her to stay on, with Iain Duncan Smith saying a leadership contest would be a “catastrophe”. Corbyn, speaking after being re-elected in Islington North, said it was time for May to “make way” for a government that would be “truly representative of the people of this country”. He later told the BBC it was it was “pretty clear who has won this election”. “We are ready to serve the people who have put their trust in us,” he said – but he also stressed he would not enter into any “pacts or deals” with other parties. 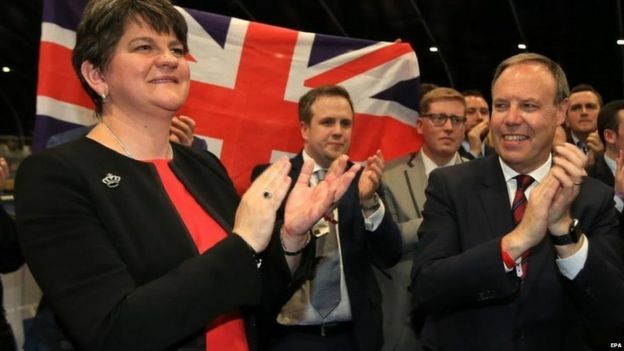 The Green Party, which held its one seat at the election but saw its total vote halve, said a Conservative government propped up by the DUP would be a “coalition of chaos”. “The DUP I don’t think are the kind of people you want calling the shots,” co-leader Jonathan Bartley said. Meanwhile, UKIP leader Paul Nuttall has quit after his party failed to win any seats and saw its vote collapse across the country. In a night of high drama, the SNP remained the largest party in Scotland but lost 21 seats to the Tories, Labour and the Lib Dems. Leading figures in the party such as Alex Salmond and Angus Robertson were defeated. Former Lib Dem leader Nick Clegg also lost his seat while Tim Farron clung on by less than 800 votes in his Cumbrian constituency. But Vince Cable and Jo Swinson are among the Lib Dems returning to the Commons after winning their former seats back. Labour’s Dianne Abbott won a huge majority of 35,139 in Hackney North & Stoke Newington. Fellow Tory MP Nigel Evans said his party had “shot ourselves in the head”. Speaking after a mixed night of results for his party, Farron paid tribute to Clegg and the other MPs that lost their seats. Congrats to Theresa May and her party for winning the General elections in England. Next year Theresa May will be sending Congrats. to the Democratic Labour Party on their victory at the polls here in Barbados. Little England. Here we go, insults , wah wah wah! She said if she loses 6 seats she will step down. She has lost 12 and hasn’t started packing her belongings yet! Do you really believe anything these power hungry people say?